Sea lions intimidate me (at least a bit) when I kayak near them in Monterey Bay. Why? First, they’re large — the largest marine animal that I usually encounter. An adult male California sea lion (Zalophus californianus) can weigh up to 850 pounds (385 kg). Although most sea lions in Monterey Bay are young males and not nearly that large, they still outweigh me. 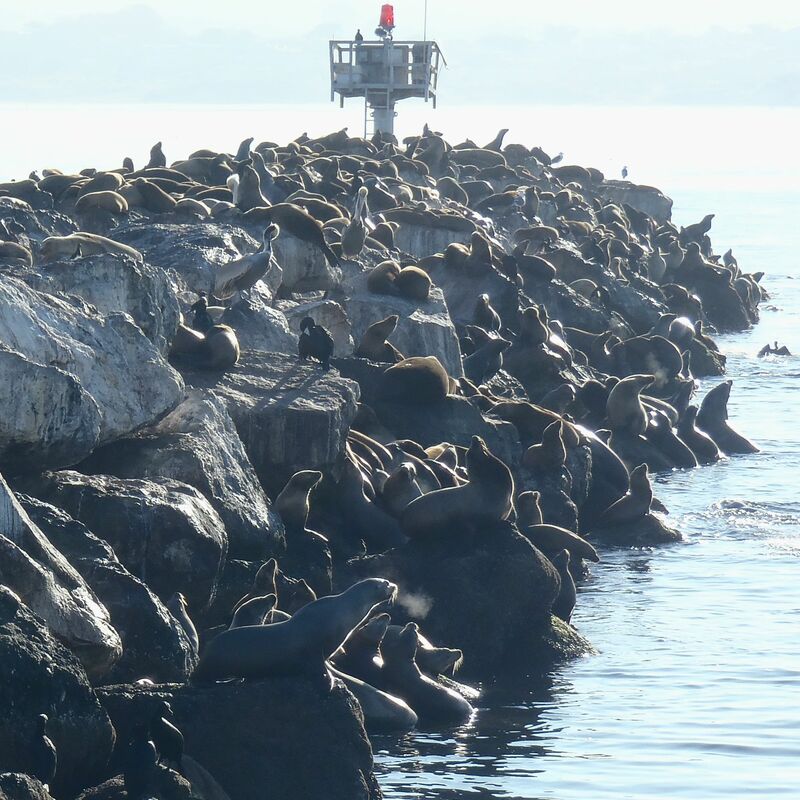 Second, sea lions are boistrous: they hang out in groups, bark noisily, splash around, sometimes follow me, and don’t watch where they’re going. One of my first encounters in my kayak was with a large bull (a mature male has a crest on his head making him easy to identify). I had just made it past the breakwater with its plethora of sea lions, and was starting to relax when I saw him swimming toward me. Then he dove. I assumed he had seen me and was headed elsewhere. Suddenly and unexpectedly, he popped up next to me. I screamed, he screamed (or so it sounded), and we veered in opposite directions. 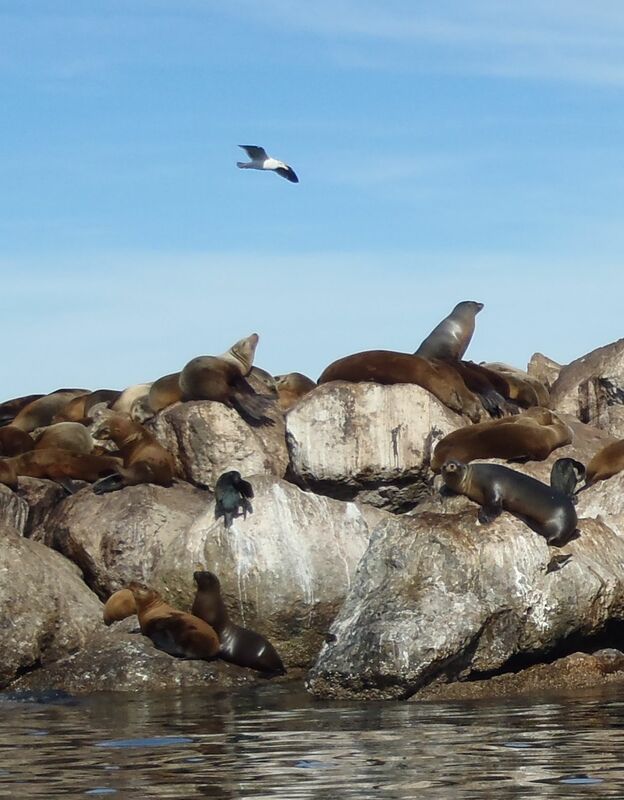 Later, I laughed at how silly, but I still get an adrenaline tingle when a big sea lion gets too close and I’m on alert when paddling among hundreds of sea lions of varied ages, sizes and comportment. California sea lions (sea lion on this page refers to California sea lions; there are other sea lion species) are one of our bay’s most prominent and recognizable marine animals (after sea otters), and may be the world’s most famous pinniped (a term for the “fin-footed” group of mammals that includes walruses, seals, fur seals and sea lions). 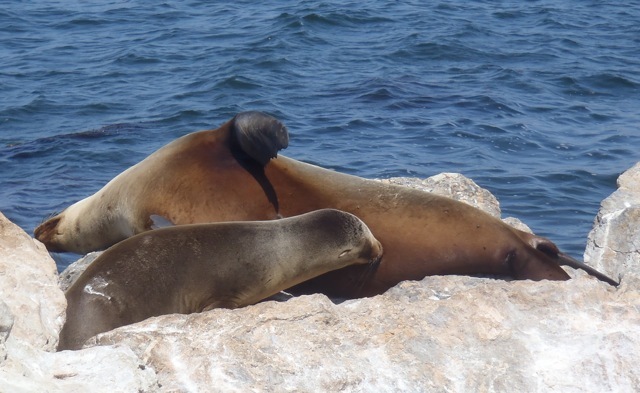 Sea lions are common in Monterey Bay and along the California coast year-round. They’re most numerous in the bay from fall through winter (September to March) when males have left their southern offshore breeding sites and migrated north. In late spring (March thru May), the numbers thin as mature males return to breeding sites (from Southern California to Baja California, Mexico) and the smaller immature males remain. We rarely have females or pups visiting. Except in the spring/summer (April thru June) of 2010, Monterey Bay had an influx of pregnant females giving birth prematurely. The sight of emaciated females and weak, dying or dead pups on beaches, boat ramps and breakwaters was horrific because there wasn’t much anyone could do. Local researchers attributed the event possibly to the El Nino conditions (a cyclical warming of Pacific waters), which drove prey fishes too far offshore for females and young animals, and/or to domoic acid poisoning (a neurotoxin produced by the diatom Pseudo-nitzschia spp.). 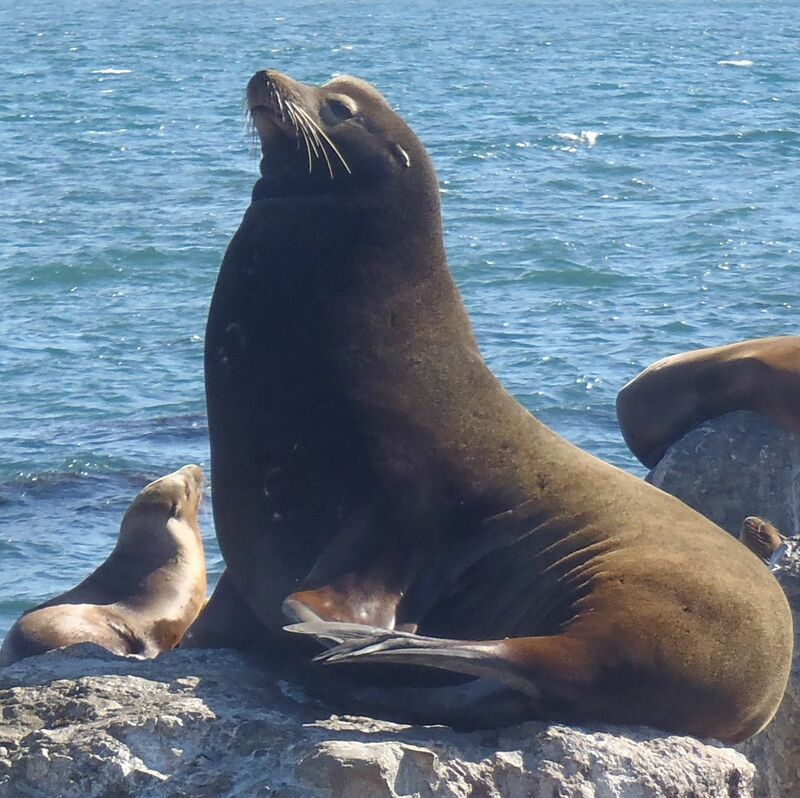 Whatever the current number, it’s a huge increase from that of the 1970s when the U.S. and Mexico strictly regulated against killing and harassing sea lions. The concern these days is not low numbers (an issue for so many species), but their high numbers. According to the IUCN, the species may be reaching carrying capacity (the number that the environment can support). On the one hand, the fact that there are so many is good news. On the other hand, this will mean more conflicts with fishers and fisheries (sea lions eat prized fish species and destructively take fish from lines and nets), and possibly more events like the deaths I witnessed in 2010. SIMoN website: Unusual pupping of California sea lions 2010.